Peggs is a brand of Rajpura, Punjab (India) based company, Raja Farms Private Ltd., which has indigenized the art of poultry technology from Europe. It delivers standardized quality eggs through most modern and hygienic process of manufacturing. It has specialized plant catering to the needs of hygienic consumption of masses. The birds are put to special care in very clean environment and being provided nutritious feeds. The eggs are of standardized quality and weight subjected to high nutrition value. From laying of eggs till final packaging, these remain untouched by naked hands. These are mechanically tested on ultramodern machines delivery consistently high quality. The brand provides customer satisfaction and helps consumers to continue getting the same quality on an ongoing basis. 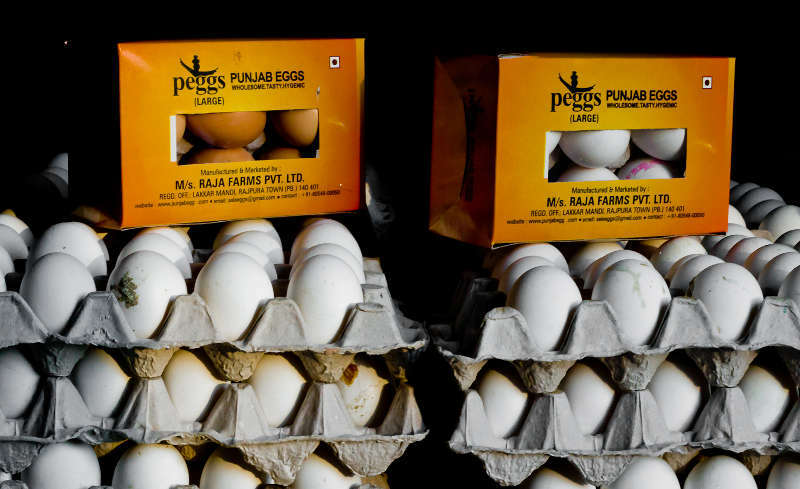 The Indian market has a high consumption pattern of eggs. The conventional way of packaging is the tray packing having 30 eggs each. The bigger tray is not very sturdy and it’s difficult to carry the same home from the retailer. This is understood by promoters of Peggs and as “Peggs” involves technological intervention from production stage till packaging, it is packed in a convenience pack of six, for retail consumption.